Canada Day Challenge National Winner Two Years in A Roll! Fiona Tung, who learnt art from 6 till 18 yrs old in BWP, was announced to have won the National Winner of the Canada Day Challenge this year. We have won two years in a roll! 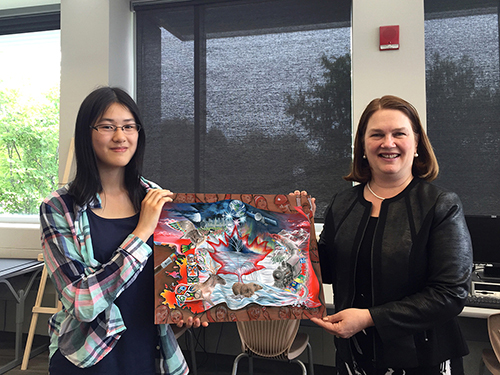 After last year's winning with Rachel Shen from our school, Fiona participated in this year's theme - "Celebrate Your Future" and got the top and only award in the painting contest. This competition is very challenging. It has NO 2nd or 3rd places but just one top winner. Over 350,000 participants from across Canada have taken up the Challenge since 1987. It is celebrating its 30th anniversary this year, along with Canada’s 150th anniversary! So it is particularly meaningful for Fiona to have won this! Royal Canadian Mint had awarded her a free trip for her and her parents to Ottawa to participate in a bunch of memorable events and earned so much experiences in the past few months such as presenting her coin design concept on stage interview, autograph signing events for Royal Canadian Mint on her coin collection and booklet like a celebrity, meeting important people in award ceremonies such as Catherine McKenna, minister of environment and climate change, Richmond Hill Deputy Mayor and Regional Councillor, Mr. Vito Spatafora, Ward Six Councillor, Mr. Godwin Chan, touring around Ottawa with family in the Tulip and Art Festival and other events; even invited to act as a judge for Richmond Hill Street Banner Design Contest! It is amazing that she earned so much life-time memories through this art experience. Let’s share the joy of her through her trip moment captures! BWP Art News - Our Street Banner Winning Design Being Displayed at Yonge St! Congratulations to our students - Chloe Tsui, Jodi Hui, Elizabeth and Victoria Wu who were selected as winner of the Richmond Hill Street Banner Design Contest! For celebrating Canada 150, the contest's theme is to demonstrate Canada's "Past, Present and Future." This contest and event is funded by the Government of Canada. Their artwork are now displayed on street banners along Yonge Street in Richmond Hill! See below their photos taken with own banners onthe street. That is encouraging that 4 out of our 8 submitted artwork were selected by the judges. Though the other 4 students didn't make it, I would like to share with you their interesting work, too. Top winning in The 22th Annual Sears Design Exchange Canadian High School Design Competition. Award Ceremony held at Design Exchange Museum. Four student entries were selected as top winners in the DX Design Contest out of the 13 BWP students participated this year. The awarded design were selected from over 700-800 entries across Canada. They are now being exhibited at Design Exchange Museum. Our student's winning 25 cent coin design is circulating now! See Joelle Wong being featured by Canadian Mint in their official video clip about her coin design which was winner of the 25 cent coin and is already circuiting now. She talked so lovely and smartly in this 1 min video, well done, Joelle! There is one colour version and one plain silver version. Look for this lovely design in your changes next time! BWP summer camps 2017 registration begins! BWP summer creative art and design camps in both Toronto and Macau are up and running for registration. Toronto in the month of July with 4 weeks of 4 different topics from 7/3-7, 7/10-14, 7/17-21 & 7/24-28; and two Macau camps starts from mid Aug from 8/7-11 & 8/14-18. Watch news about that later. If you are interested to know more and earlier, message me for details! We had a good time on the 6/11 Outdoor Sketching Trip at Edward Garden! In 3 time sections for different age groups, students have done lots of nice drawings and demonstrated that they have all learnt and improved in how to capture what they see in better proportions and detailing. 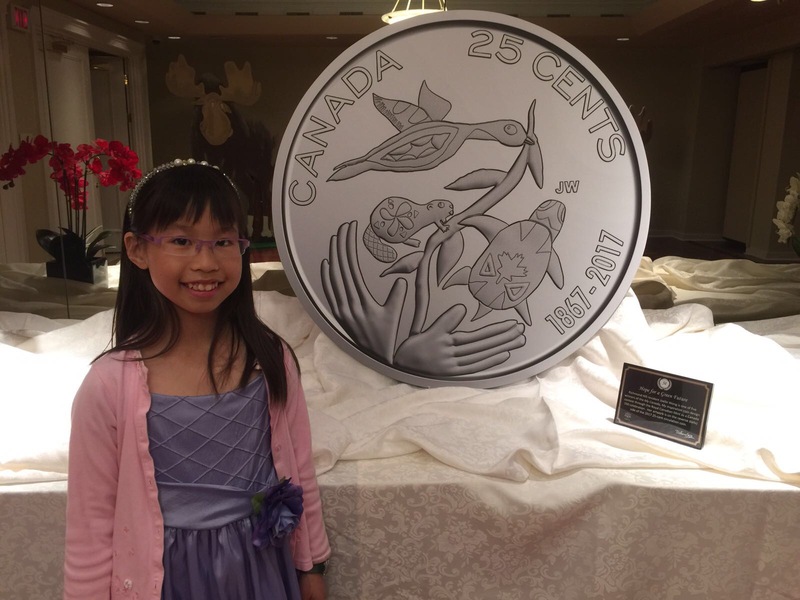 Joelle Wong is unveiled as the final coin winner of Canada 150th Anniversary Coin Design Contest in the "The Future Canada" category! After our school's 3 students (Joelle Wong, Kelly Tsui and Candace Wong) were all successfully selected last year from 10,000 submissions by notable judges and Royal Canadian Mint as finalists for national votes, Joelle is announced on Nov 2nd as the final and youngest winner ever in Canadian minting history! Out of more than 1 million votes, her coin design got the most popular votes in the "Future Canada" category. Along with 4 other winning designs in older groups from different parts of Canada, her coin design is minted as one of the 5 coins for circulating from spring 2017! 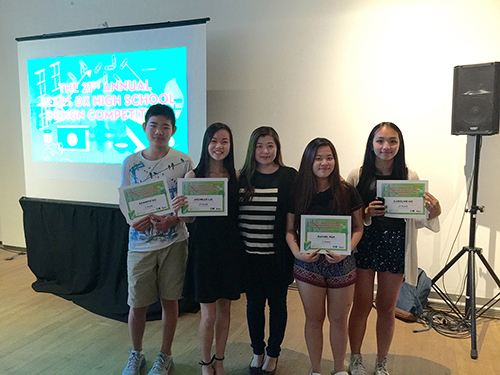 THE ANNUAL SEARS DX CANADIAN HIGH SCHOOL DESIGN COMPETITION 2015-16 has been announced. Students from Beware Wet Paint received two 1st and two 2nd Place Awards in Architectural/Interior, Industrial, Costume Design. On June 20th, they were all awarded in the award ceremony held in Design Exchange Museum in downtown Toronto. They received certificates, monetary awards and the experience of learning workshops in Sears/DX and meeting with design professionals in the market. The top winners of the 2016 Canada Day Challenge proud to be Canadian through art, photography and creative writing, were revealed in an announcement ceremony held in Markham region, Ontario by the Honourable Jane Philpott, Minister of Health, on behalf of the Honourable Mélanie Joly, Minister of Canadian Heritage. This year, the theme is "What makes you proud to be Canadian?". 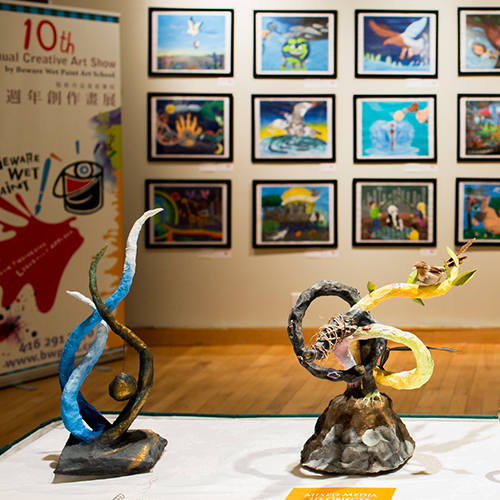 Rachel Shen who has been learning creative art in Beware Wet Paint Art School since the age of 6, beat the other youth candidates from 8 to 18 years old across Canada to stand as the national top winner in the drawing category. Our young student, Joelle Wong, 9 was awarded 2nd place in the 16th CALCY (Chinese Arts and Literary Contest for Youth) Award Ceremony. She was a selected winner of the 3rd, 4th grade age group. With the theme about "Deep Sea Ocean", she put into all her favourite ocean animals cleaning up their precious home. In this contest, she was provided with very limited time, just 1 hour and 15 mins to complete and express what she wanted to create about this topic in watercolour. Joelle has demonstrated a great impressive work in coming up all this details about her care for our beloved ocean lives! Elizabeth was also selected as the 3rd place art winner of the 5th, 6th grade age group. She chose to do colour pencils to show a lot of liveliness. 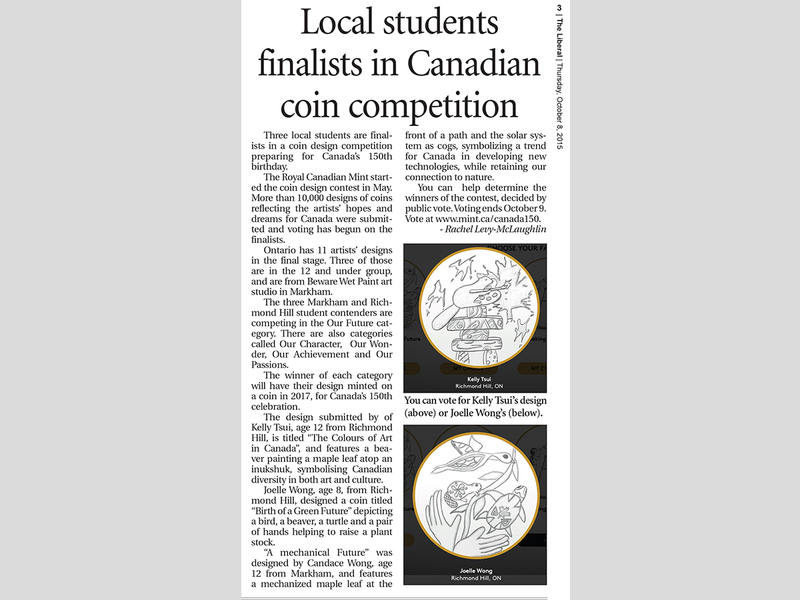 3 BWP Students in York Region are selected as National Finalists in the Royal Canadian Mint Coin Design Competition! 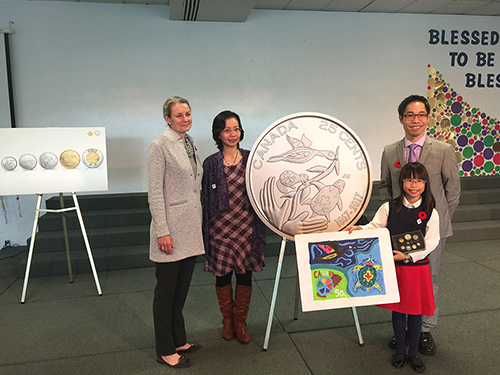 In the Canada 150th Anniversary Celebration Coin Design Competition held by Royal Canadian Mint, 3 BWP Students Joelle Wong (6), Kelly Tsui (12) and Candace Wong (6) from York Region are selected out of 10,000 entries from around Canada as the National Finalists as the National Finalists in the youngest Design Category - "Our Future". The contest was open for public vote around the world from Sept 6 - Oct 9. Winning design with the highest vote from each of the 5 categories will be minted in 2017. Mint Canada announced that 1 million people have voted! We are proud of our students to have come this far! 3 BWP students are announced to be top winners! Congratulations to all of them! 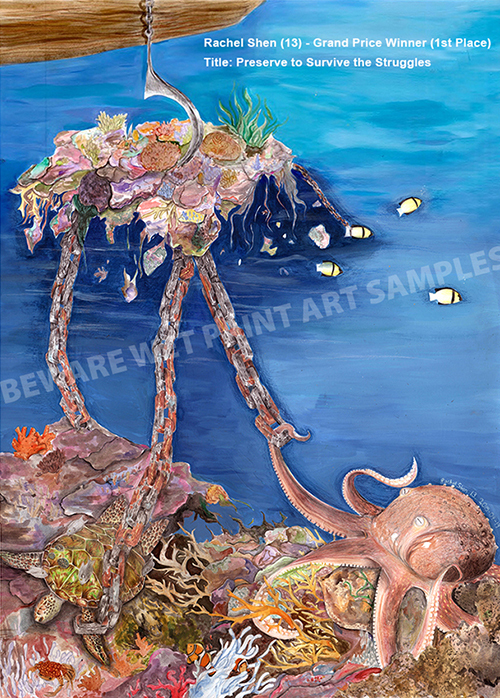 In the 2015 International Youth Painting Competition Science without Borders® Challenge: “Coral Reef Relationships.” Out of 17 countries' submissions, Rachel Shen (13) 's "Preserve to Survive the Struggles" art piece was selected as the grand prize winner (1st Place) and and Jonathan Xu (12) 's "The Precious Ocean Jewels" as 2nd Place for the middle school category. 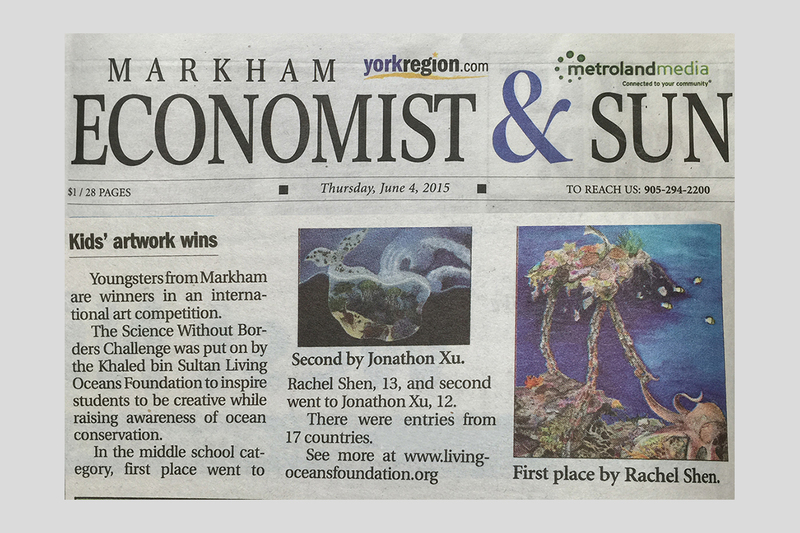 Natasha Chen (12) 's "Coral Reef Struggles" and Caroline Mo (13) 's "The Throne of Protection" are both selected as finalists. We are glad that in this summer, BWP was invited by Stagefaom, Macau to carry out two Creative Summer Art Camps in Macau for the very first time. An art exhibition was held from 8/23 till 9/1. 4 different weeks of BWP's Summer Creative Art Camps had been smoothly done and we were glad to have lots of students of various ages participated. It was so fun and inspiring to see them create a varieties of art stuff! 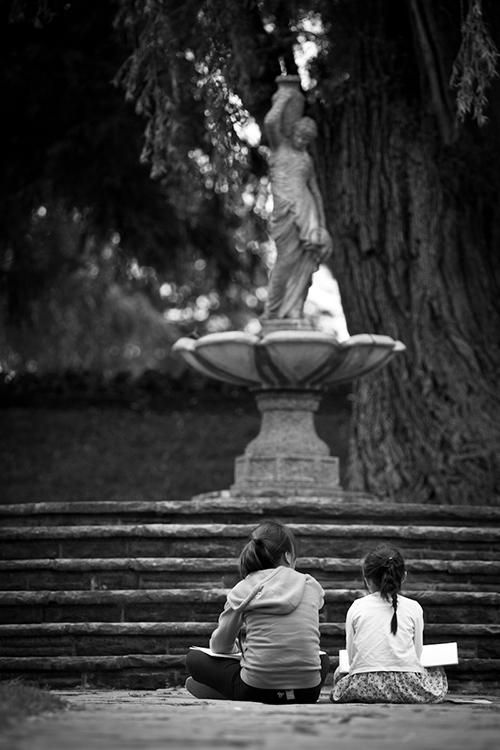 On September 20th Sunday, we had our annual special outdoor sketching trip at Edward Garden. It was great weather for students to enjoy the appreciation of nature through their art, also good time for some family fun together on the weekend! DX Canadian High School Annual Design Competition held by Toronto Design Exchange and Sears	Out of our 14 submissions, 6 of our students are announced to be winners! Congratulations to all of them! The award ceremony was held on June 13 at Design Exchange Museum. 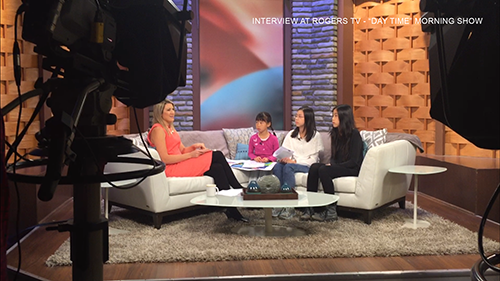 Two of our students, Fiona Tung and Kelly Tsui were selected as one of the 25 Regional Finalists from all over Canada, i.e. 2 of the 5 only semi-finalists representing Ontario in the Google Doodle Design Contest to beat for being the National Finalists & Final Winner. Helena's Stamp Series - Animal Protection was issued by Macau Post Office on April 28. We are glad that Emily Xu, 9 years old was announced to be one of the winners in the "2014 China Panda Cup" Student Painting Competition in the junior group. Award ceremony was taken place in a banquet hall on Nov 30th. The Chinese General Consulate, news media, judges and all winning students' families and guests were invited to the ceremony and lunch event. The theme of the picture is about "Love For Your Homeland". 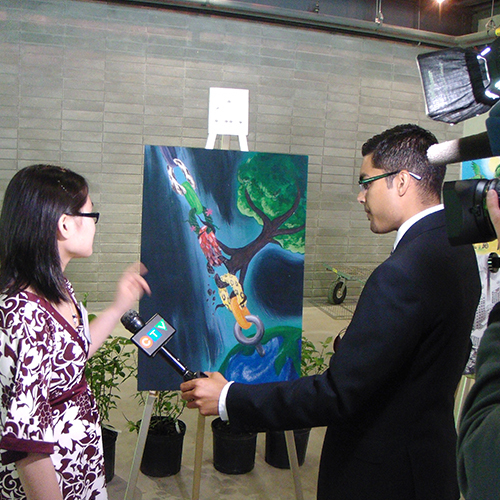 During the interview, , Emily has expressed that as a Canadian grown-up Chinese girl, her love for both Canada and China which she has visited when she was very little, by using a tree combining of Maple Tree Leaves and Chinese Cherry Blossom Flowers to separate beautiful sceneries of China and Canada. She has spent lots of heart and effort in this Acrylic paintings (23" x 17"). Very pretty work for her age. This competition was originated in China with over 10 years of history and the Toronto contest is in its 2nd annual. 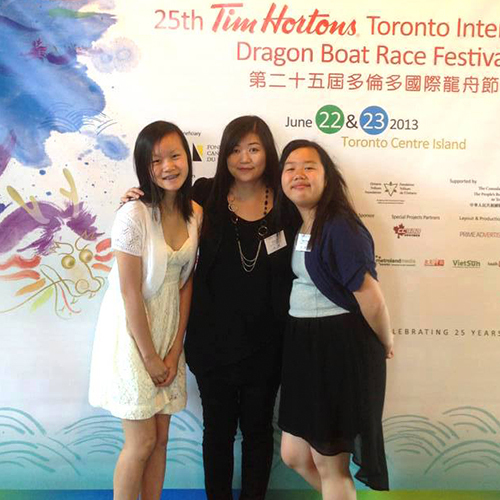 All our entering students received awards including 2 top awards - the Art Star (Catherine Cheung and Tiffany Cheung). Markham Vise Mayor, Toronto Councillor and Chinese Consulate were invited to the award ceremony held in Markham Civic Centre. Click to see the complete long winning lists and the charity exhibition after held in downtown. "The 2nd International Painting Competition in HK" with theme "Festival"
Roslyn Nip from Beware Wet Paint won the Honourable Mentions out 12000 entries from 51 countries from Asia, North America and Europe. She is the only selected winner among North America. 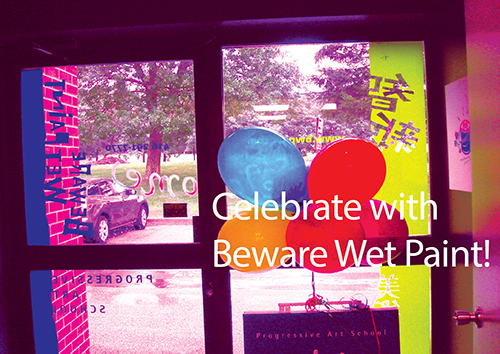 - Markham Mayor, Frank Scarpitti & Councillor Alex Chiu presented achievement certificate & encouragement letters to congratulate Beware Wet Paint's achievement in the field of Art Teaching. & encouragement letters to congratulate Beware Wet Paint's achievement in the field of Art Teaching. BWP Annual Christmas Creative Art Show 2014 "The Christmas Dreams" was held on Dec 14 - 23, 2014 at CCM Centre. Many students and guests came on our Grand Opening Day. There are over 130 paintings participating this year in our Year-End Christmas Creative Annual Art Show. Among them, 50 paintings were selected to receive top winners, distinctions and special awards. See below to see the highlight of our award ceremony that day. The theme of the Annual Creative Art Show this year is "The Christmas Dreams". was held at Scarborough Bluff on July 6th Sunday. More than 75 students participated that day. Happy Father's Day! will be held from July 7 - Aug 2 with 4 creative themes in a roll. Our summer camps are getting so popular. So we added 1 extra week. Once we gave out the details, the first two camps were filled in 2 weeks while other weeks were closed to full. Helena's corporate logo branding design series created for Alzheimer Society of Ontario - "Finding Your Way Program Campaign Design Series" from the Not-For-Profit Client-Initiated" category was selected to be one of the final 42 winner projects for the 4 main categories. There were 190 entries submitted from 7 countries. - Helena won 1st place of adult professional group. 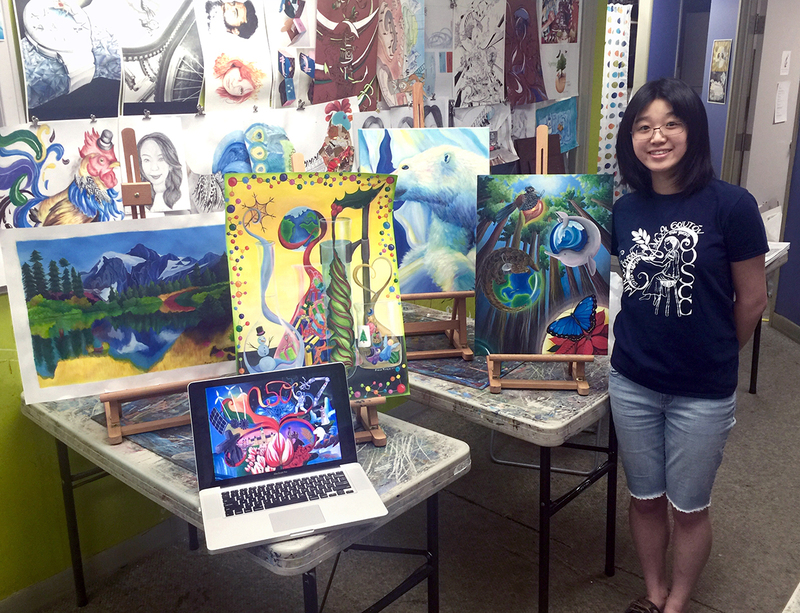 Emily Xu's space painting - "There is no limit in friendship" won 3rd Place out of more than 4,700 entries representing 45 countries in the world. Her work was awarded by Former Astronaut Leroy Chiao and exhibited in Colorado Spring! It was created into DVD which will travel to the International Space Station (ISS) abroad by a Japanese rocket in summer 2013! 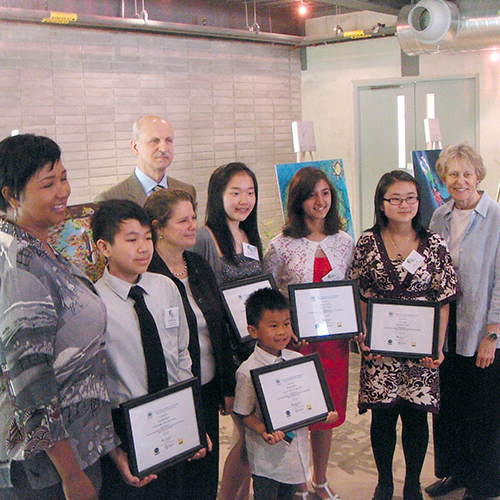 United Nation International Children Contest 2012 - "Water is the source of life"
Six BWP students (Angela Yang 8, Raechell Teo 11, Fiona Tung 14, Emily Tang 9, Jeffrey Gao 9, Jun Bin 8) are selected as parts of the top 50 finalists of North America region to compete in the global round against other world winners. Veronica Chiu (age 14) - Her recent impressionlist-style painting got the first prize in her school's painting contest demonstrating harmonious colours and creativity. • was held on June 9th, Sun afternoon at Richmond Green Park. More than 60 students participated. will be held from July 15 - Aug 3 with 3 different great creative themes. BWP Principal, Helena Ng's creative illustration series "Black and White" was selected as one of the 200 finalists in the first round and awarded a Merit Award, from over 2500 pieces of work participating from 60 countries. Michelle Lai attended award ceremony in June in Washington, D.C. and received her award in Rio, Brazil on Oct 10, 2012! She and her parents were accommodated both wonderful trips to receive the awards. 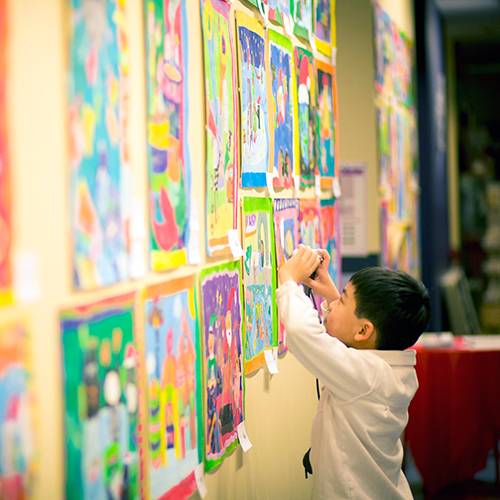 The Canada International Children’s Art Festival is an annual event for young artists from ages 4-17. Twenty-one of our students have participated in this exhibition, along with hundreds more from Canada and Asia. Award ceremony and exhibition at the City Hall in downtown Toronto. We received great awards including Best Teacher for Helena Ng, Best School Team, 3rd Prize and a number of Distinctions. 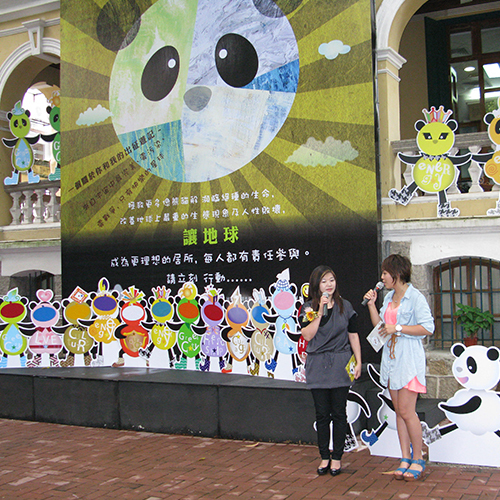 Illustration Book Issue - "PandaPal Mission to the East"
Helena has released her first creative illustration book, PandaPal Mission to the East in Macau. 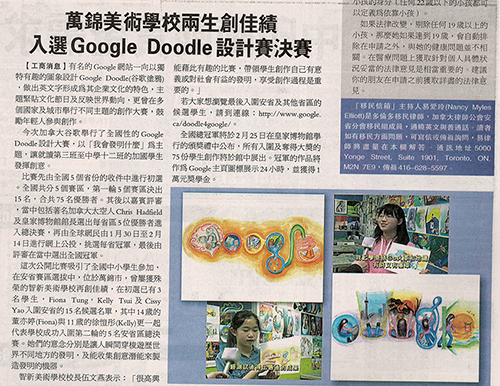 A big exhibition of the same titles was held on Sept 3rd at 10 Fantasia, Macau. The whole historical building was transformed into a 3D version of the newly-issued illustration story book. 2012 Annual Christmas Art Show & Award Ceremony held at CCM from Dec 16th - 23rd. • The art Show theme was "Spread the Joy". Sun afternoon at Richmond Green Park. Many students attended. 2012 Outdoor Sketching Trip was held on July 29th, Sun afternoon at Richmond Green Park. 2012 Summer Camp will be held from July 16 - Aug 3 with 3 creative themes. 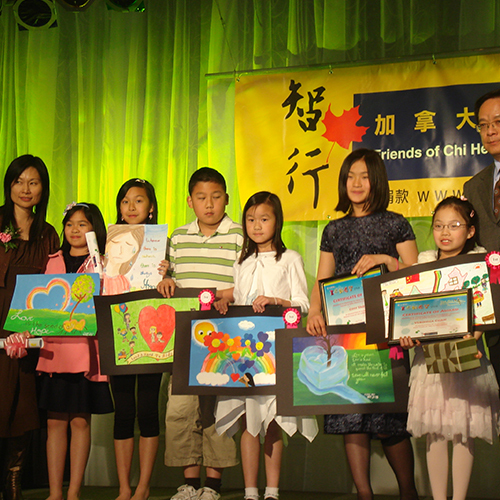 United Nation International Children Contest 2011 - "Life in the Forests"
Great achievements from BWP students. Selected among the 2000 entries of the North America Region. More than 600,000 age 6 - 14 kids from all over the world joining this year and just China has over 3.4 million children participated. 2011 Annual Christmas Art Show & Award Ceremony held at CCM from Dec 18th - 27th. The art Show theme was "Spread the Joy". 3 outdoor sketching trip was held on June 12th, Sun afternoon at Edward Garden, Main Street. Many students attended. were held on June 12th, Sun afternoon at Edward Garden, Main Street. Many students attended. will be held from July 18 - Aug 5 with 3 different themes. Helena's Stamp Series - Bank of China 60th Anniversary was issued by Macau Post Office on Jun 21st. Helena's illustration was selected as one of the 16 art pieces to be exhibited in the Macau Pavilion In the World Expo 2010 held in Shanghai. Sofie Yang won first price 2 yrs in a row! 2010 Annual Christmas Art Show was held at CCM Centre from Dec 17 - 23rd from 10am - 5pm. BWP Award Ceremony & Gathering for students & guests held on Dec 19th. Our students' selected Christmas paintings are showcased and sold as special Christmas card collection again to help raising fund for Orbis Canada in their annual sale booth in First Markham Place on Nov 14th. were successfully completed on July 19 - Aug 6 with 3 new themes. 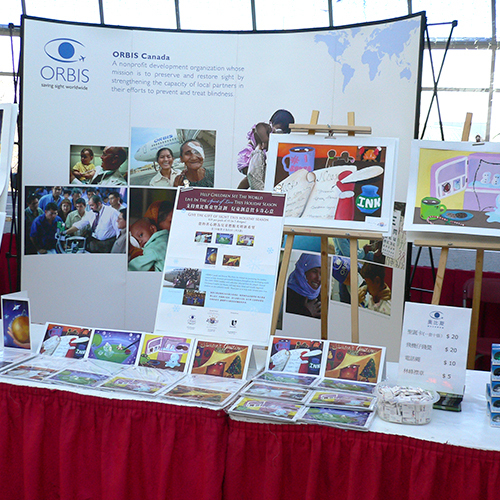 Orbis Canada chose 5 of our students' previous Christmas paintings to be produced to Holiday Card series for charity sale throughout Cananda through their website. Sale booths and exhibits were held at different shopping centres and in BWP for the charity sale. BWP helped to raise about $1800.00 in the card sale. 2009 Annual Christmas Art Show & Award Ceremony held at CCM Centre from Dec 16 - 23rd. 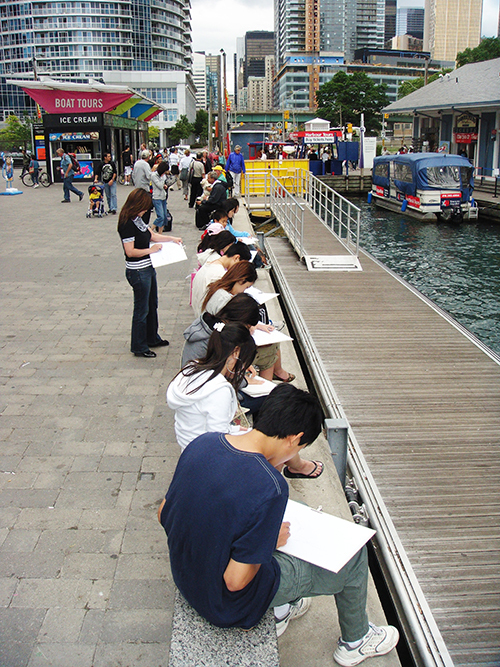 2009 Annual Summer Sketching trips at The Guild, Harbour Front, Distillery District for whole school and smaller interest groups were held in this summer. 2009 Summer Camps will be held from July 20th - 31st with 2 creative themes. A very fun camp filled with paintings, crafts, 3D projects, origami, movies & games....etc. Xmas Card Sale Fund-raising event using BWP students' creative card collections to help the Friends of Chi Heng Foundation for helping the Aids-affected orphans in China. BWP helped to raise about $800.00 in the card sale. 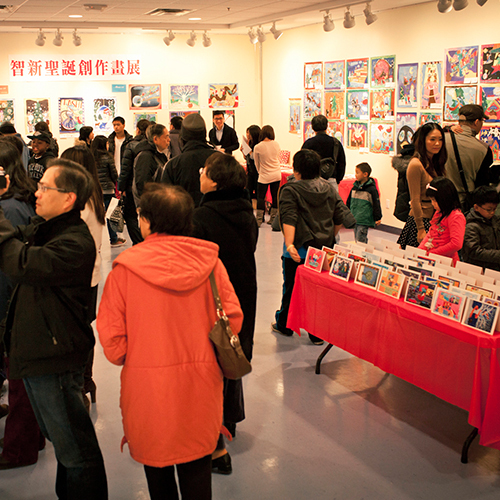 2008 Annual Christmas Art Show & Award Ceremony held at Toronto Chinese Cultural Centre on Dec 21st. 2006 Annual Christmas Creative Art Show & Contest Ceremony held on Dec 16th at school. Celebration to follow. BWP moved to new location! Grand Opening celebration with art display on September 2nd. 2006 Annual Outdoor Sketching Day was held in May 14, Mother's Day at Main Street. The Mandarin Lions Club Drawing Contest with the theme of "Happiness"
Our first BWP Student ART SHOW held on our Annual Open Day in April. More than 200 selected student works are exhibited! 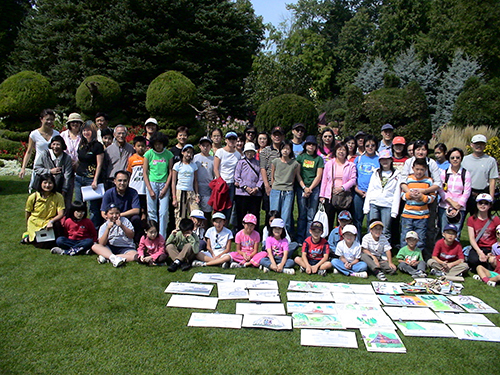 Our first Summer Camp "Celebrate the World"
Outdoor Sketching Day 2005 was held in Cullen Garden. More than 90 people had joined our fun trip. Cross Canada Christmas Card Drawing Competition held by Pierre Belvédère Group was announced. Students have great fun in the outdoor Sketching Day 2004 held in Edward Garden. 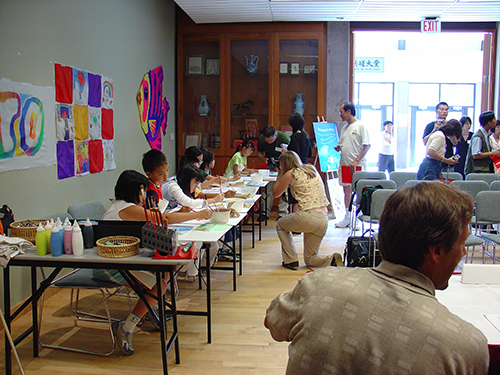 “World Heart Day” Drawing Contest held by Chinese Cultural Centre of Greater Toronto and the International Heart Health Network. This contest was to bring in the global awareness of the importance of heart health for youth. Christmas celebration at BWP for the whole school and parents. 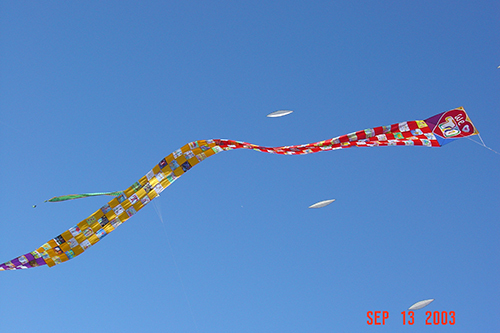 The ‘We Love Toronto’ theme kite of KiteFest 2003 sponsored by BWP was launched! Mar 1st is our School Starting Day!